If you've been following my social media you will have seen I've been testing out a new skincare range for the last month. 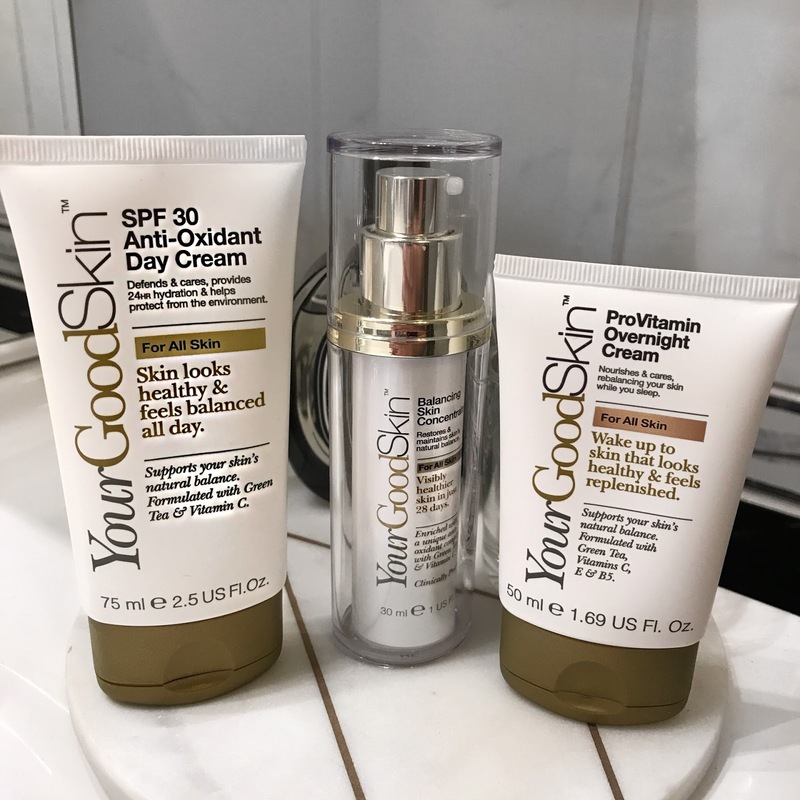 Your Good Skin launched into Boots last month and I wanted to try it and see how I got on with it. There is a huge amount of products in the range and they are so affordable and something to suit every skin type. I wanted to share my top 5 products from the range as I used them most days for the last month. The number one product for me is the SPF 30 Anti-Oxidant day cream. I just love how my skin looks and feels after I used it. It looks so fresh and dewy and feels so soft. It also has an SPF so it is perfect for everyday use. The day cream contains green tea, vitamin E and vitamin C which are very hydrating on the skin. The next product I love is the Balancing Skin Concentrate. It's very lightweight but super moisturising and my skin feels amazing since I started to use it. I use it twice a day after cleansing and I've noticed a difference in my skins tone and texture. I used the Pro Vitamin Overnight Cream each night and the next morning my skin felt like silk, super hydrated and restored. It contains Green Tea, Vitamin C, Vitamin E and has non pore-blocking formula is formulated without parabens and is oil- free. I used this after applying the Balancing Skin Concentrate. The next product I love is the Hot Cloth Cleanser, it removes makeup so easily and leaves my skin feeling squeaky clean and fresh. It comes with a muslin cloth and contains Green Tea, Vitamin C & Bisabolol. The last of my favourite products is the Blemish Clearing Rapid Rescue Treatment. Last week I had a really painful blemish on my nose that wouldn't budge and was so sore touch, I applied the treatment to the spot and within hours the blemish had reduced in size and wasn't half as sore. The next morning the spot was completely gone. I hope you enjoy the range as much as I do and check it out.